The 17-day campaign named the Sustainable Development Goals Vodafone Bula Youth Tok was launched at the Ivi Triangle in Suva. Vodafone Fiji has set up a campaign that will enable Fijians to under­stand the importance of the 17 Sus­tainable Development Goals (SDGs) as out­lined by the United Nations. 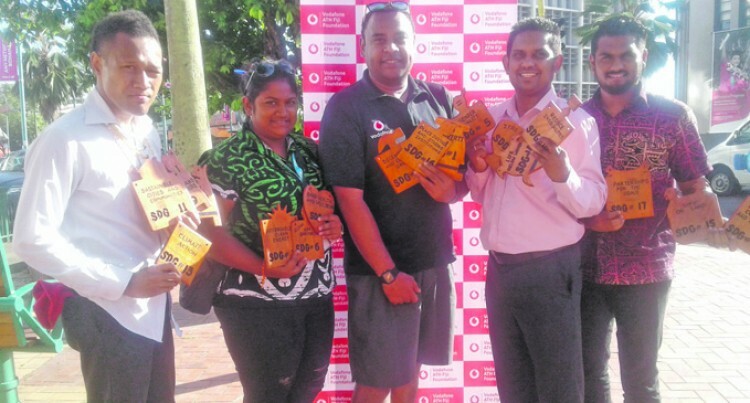 The 17-day campaign named the Sustain­able Development Goals Vodafone Bula Youth Tok was launched at the Ivi Triangle in Suva. The Vodafone front line trainer Usaia Tu­kana said the launch was a significant one because it highlighted life. “The SDG’s Bula Style is simply the lo­calisation of the Sustainable Development Goals,” Mr Tukana said. He said our people have no idea what the SDGs were. “The concept of the Suva City stroll is practically engaging people to have an in­terest in knowing what the SDGs are and the target is to reach grassroots,” he said. The campaign will last for 17 days. He said youths were encouraged to partici­pate in the campaign. Vodafone ATH Foundation Executive Di­rector Neil Maharaj said the mission would be to collect all the 17 goals which would be placed at hidden locations around Suva City. He said behind each goal there would be a task to complete which would link to the meaning of the goal. “Before the campaign starts the partici­pants will be trained and awareness will be raised on what the SDG is about and the 17 goals,” Mr Maharaj said. The Sustainable Development Goals (SDGs) are a collection of 17 global goals set by the United Nations. The broad goals are interrelated though each has its own targets to achieve. The total number of targets is 169. The SDGs cover a broad range of social and economic development issues.